The Elm Grove Eagles clinched a share of the Bossier Parish middle school seventh-grade district championship with an 20-0 victory over the Greenacres Mustangs on Tuesday at Preston Crownover Stadium. The Eagles, who improved to 8-0 overall and 4-0 in district, can win the outright title with a victory over Haughton at home next Tuesday. Haughton defeated Cope 14-12 in overtime. Greenacres dropped into a second-place tie with Rusheon at 3-1. Rusheon knocked off Benton 36-18 at Bossier’s Memorial Stadium. Rusheon and Greenacres meet Tuesday at Airline Stadium. In eighth-grade action, Haughton won a 22-16 overtime thriller over Cope to take sole possession of first place. Haughton improved to 3-0, and Cope dropped to 2-1. Elsewhere, Elm Grove edged Greenacres 22-14, and Benton dropped Rusheon 27-8. In an eighth-grade make-up game Thursday, Elm Grove defeated Benton 22-0. Elm Grove 20, Greenacres 0: Amani Larry ran for one touchdown and passed for another to lead the Eagles. A long run by Larry set up Elm Grove with a first-and-goal early in the second quarter. Elm Grove quarterback Amani Larry breaks loose for a long gain during the Eagles’ seventh-grade victory over Greenacres Tuesday evening at Preston Crownover Stadium. On fourth down from the 3, Larry hit Alijah Barnette in the front of the end zone for the TD. Greenacres stopped the try for two. After Elm Grove recovered a fumble, Larry ran 10 yards around right end for a touchdown with 38 seconds left in the half. His conversion run made it 14-0. Zeke McKnight’s 65-yard run set up the Eagles’ final TD, a 2-yard run by Alec Crain. Coach Mark Tabor said Caleb Reese and Codie Bickel were defensive standouts. Rusheon 36, Benton 18: Jacoby Decker scored three touchdowns to lead the Rams. Decker scored on runs of 30 and 25 yards. He also returned a punt 50 yards for a touchdown. Montrez Henderson ran 20 yards for a touchdown and returned an interception 70 yards for a score. Henderson also scored two two-point conversions. Joseph Wiggins and Brenden Moseley had interceptions. Shucurio Thomas had a fumble recovery. A pass from Brad Fream to Ethan Yarbrough set up Benton’s first touchdown, a Bubba Osby run. Osby also caught a 60-yard touchdown pass from Fream just before the half. Fream scored the Tigers’ final TD. Haughton 22, Cope 16, OT: Kynan Hayes scored on a 10-yard reverse on Haughton’s first overtime play to give the Bucs the 22-16 lead. After Haughton missed the PAT, the Cougars went on offense with a chance to tie or win. Haughton’s Harrison Voight made two stops for losses and Cope faced a fourth-and-goal from the 13. Matt Hunter found Jaylon Thomas over the middle, but Thomas was stopped just short of the goalline, giving Haughton the victory. The game was tied at 8 after three quarters. Cope recovered a fumbled snap at the Haughton 2 early in the fourth, but a penalty moved the ball back to the 7. On fourth down from the 4, Hunter rolled out and hit Travacier Jeter for the touchdown. Cameron Davis’ two-point conversion gave the Cougars a 16-8 lead. Haughton answered with a 50-yard touchdown drive. Hayes broke loose for a gain to the 30, and Jalob Walker scored on the next play. Walker’s conversion tied it at 16 with 4:22 left to play. Hayes scored Haughton’s first touchdown and the two-point conversion. Haughton coaches said Voigt, Cade Thompson and Lavonta Gipson were defensive standouts. Thomas led Cope with 107 yards on seven carries, including a 9-yard touchdown run. Davis had 45 yards on 10 carries and two conversions. Calvin Arceneaux helped cause two Haughton fumbles, and Kobe Johnson recovered two. The Cougars hurt themselves with 95 penalty yards. Jeter had an interception late in regulation. 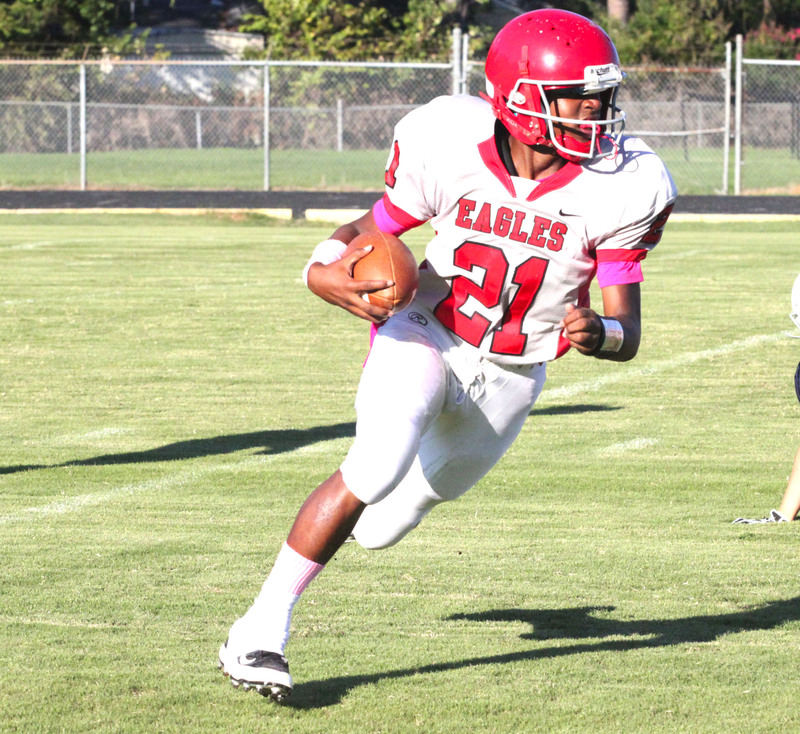 Elm Grove 22, Greenacres 14: Kendall Brown, Quinton Smith and Terrace Marshall scored touchdowns for the Eagles. Brown went 40 yards for his TD, and Smith went 10. Marshall caught a 30-yard TD pass from Knije Harrison. Harrison and Brown scored conversions. Darious Bradford, Craylon McGee and Eric Williams were defensive standouts, Tabor said. Greenacres’ Colby McGee went 75 yards for the Mustangs’ first touchdown. Steven Lutterman passed to Kyle Crump for the conversion. Tannin Johnson also scored on a 45-yard run. Lammarea Scott had an interception. Greenacres coach Justin James said he was proud of the Mustangs’ effort. “They fought to the end,” he said. Benton 27, Rusheon 8: Coach Jared Stowell said Doyle Adams had a big game for the Tigers, including a touchdown catch in the corner of the end zone late in the first half. Raheem Randle and Jermaine Newton also scored touchdowns. Carter Parks kicked a PAT and was outstanding on defense along with TJ Anderson, Stowell said. Elm Grove 22, Benton 0: Kendall Brown scored an offensive and defense touchdown to help the Eagles win a game that was postponed last week because of severe weather. Brown caught a 5-yard TD pass from Knije Harrison and returned an interception 50 yards for a touchdown. Harrison also threw a 6-yard TD pass to Cameron Phillips. Phillips and Terrace Marshall caught conversion passes. Elm Grove coaches said Brown, Rhyonce Thomas and EJ Williams were defensive standouts.